In our testing, these are the best tasting emergency food bars on the market. The 2400 calorie package contains 6 food bars with 400 calories of food each. That's equal to a low cal meal in one bar. The food has a pleasant taste similar to an oatmeal cookie, but is designed to reduce your thirst, thus helping to conserve your emergency water needs unlike a store-bought high-calorie "energy bar". Recommended for 2 days - 1200 calories per day. Foil wrapper for freshness. 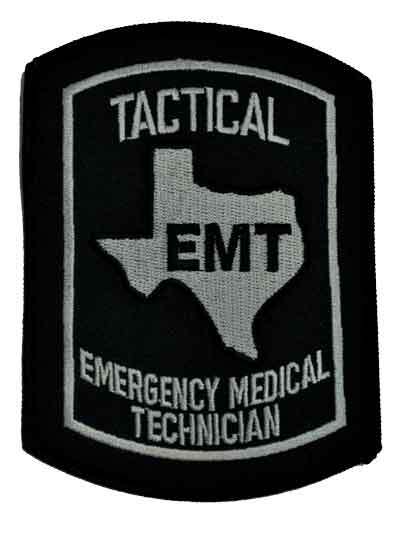 USCG approved. Natural Disasters: Earthquake, hurricane, flood, tornado, famine relief, etc. 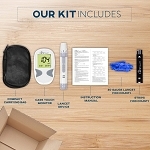 Could be placed at home in emergency kit, in every car, school, or with other emergency supplies. Recreational: Hiking, biking, camping, caving, mountaineering, and wilderness exploration. 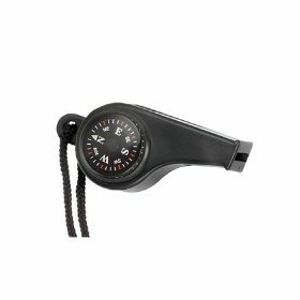 Aviation: Emergency survival gear and emergency liferafts. General Description: A Compact, fortified, efficient, baked survival food ration specifically formulated to provide a balanced minimum daily diet with limited drinking water availability. 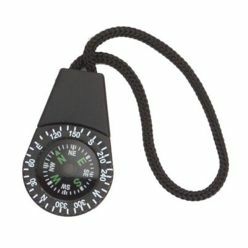 It is specifically designed for personnel required to abandon ship and for all other natural disasters to sustain life until rescue or additional food is available. Suitable for: All age groups from infants through elderly. Dietary Standard: Complies with Halal and Vegetarian requirements. Product Use: Can be eaten as is without any preparation. For infants, elderly, or injured people, can be used with liquids for drinking or mashed into porridge. Main Ingredients: Wheat flour, vegetable shortening, sugar, coconut, corn starch, corn syrup, vitamins. Packaging: Grease proof, water vapor proof MIL B-131 barrier material. Heat sealed under partial vacuum. 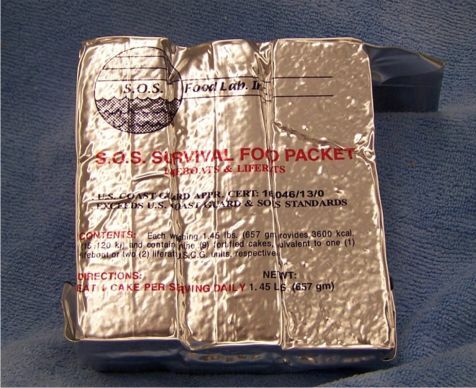 The lightest and most compact emergency food ration. S.O.S. products require 20% less space and weigh less than other products with equivalent caloric content. 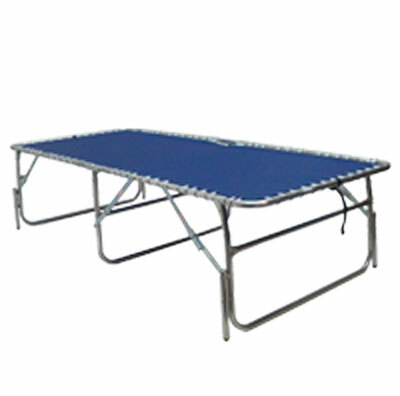 An inexpensive and economical product with superior quality. 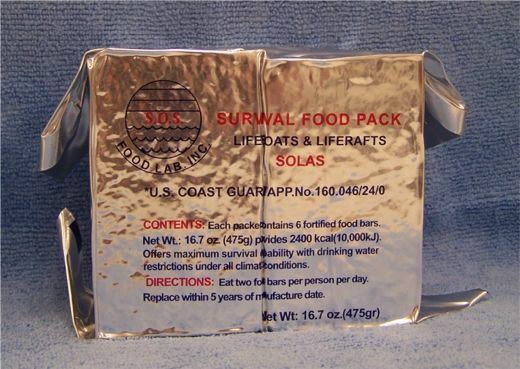 Significant savings for compliance with U.S. Coast Guard and International Maritime Requirements regarding survival food rations. 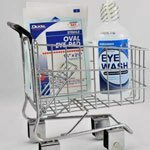 Dramatic savings of 10%-37% over other products for transportation, handling and storage cost due to reduced weight and volume. Baked products which are healthier and more palatable than compressed, uncooked products. Drastically reduced sugar-derived calories to 15% of total energy. By contrast, obsolete emergency food packets added sugar cubes or tablets to supply 27%-47% of total calories. Excellent sensory properties of taste, flavor, color, texture, aroma and palatability which are developed only from careful formulation and baking of selected natural ingredients. Sufficient carbohydrates (56% wt) and high caloric density (5.5 kcal/gm; 23.1 kJ/gm) to prevent keto-acidosis resulting from metabolism of body fat due to prolonged hunger. Ketoacidosis is caused by a change in metabolism which makes the body's pH become acidic (rather than neutral), affecting the organs. Restricted protein (4.9%) and low sodium (29 mg/ser.) which reduce physiological body water requirements, minimizing thirst and urination, preventing dehydration, improving morale and prolonging life expectancy. Food components which are compatible with drinking water restrictions typical of ocean rescue conditions, and are NOT gas-forming, costive or cathartic. Convenient to eat survival food rations which can be consumed either dry, or mashed with water when normal chewing is impaired. Low moisture content prevents freezing problems under extremely cold weather conditions. Assured reliability due to extensive technical experience in development and manufacture of specialized nutritional and confectionary bakery products since 1967. 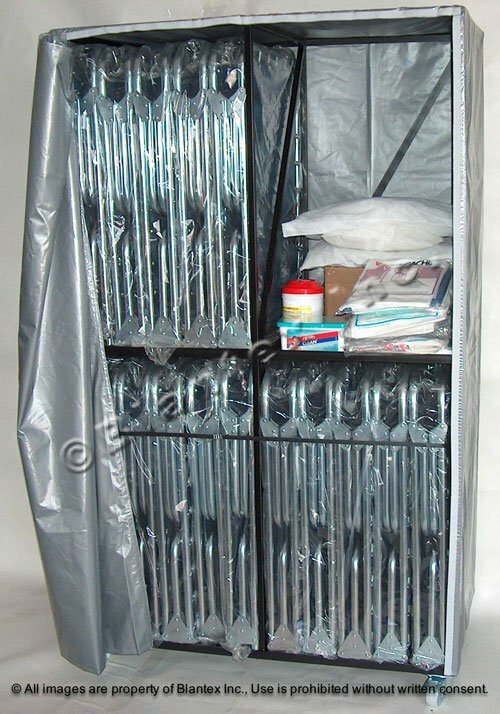 Shelf life: Up to 5 year shelf life, may be safely stored in all climatic conditions. The shelf life is from the manufacture date at the factory and does not include time sitting in storage at our facilities. In general, no order of food or water will arrive to the customer with the full 5 years intact. U.S. Coast Guard approval No ??s. T.C. Canadian Approval No ??s. Case and pallet shipping Info. 40 packages per case at 46 lbs per case. As the cost of shipping cases and pallets of food of water is very expensive and fluctuates almost daily, you must call for current shipping prices to your location(s) We are happy to quote freight from us or use your shipping accounts to arrange the best pricing for your needs. ATTENTION Agency Purchasing Dept. : When buying large quantities (20 plus cases or full pallets) This product is sold on a first-come, first-sold basis. 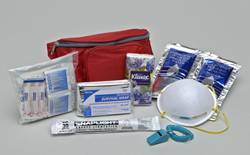 Emergency food and water is manufactured as it is needed for customers. The manufacturer can only make a set amount of product each day. The process to make a food bar takes over 24 hours and requires the right mix of food products, special packaging materials and quality control to ensure long-lasting high-quality product. Their is no stock pile available at the factory to supply tons of finished product the day o f your major disaster. They can't just put on another shift to produce more because now an agency wants to buy it. You and your agency must budget and plan (and pre-pay) for any large order before your disaster.